Bashiri, M., Rezaei, H., Geranmayeh, A., Ghobadi, F. (2015). A Comparison of Regression and Neural Network Based for Multiple Response Optimization in a Real Case Study of Gasoline Production Process. Journal of Industrial and Systems Engineering, 8(3), 77-94. M Bashiri; H R Rezaei; A Farshbaf Geranmayeh; F Ghobadi. "A Comparison of Regression and Neural Network Based for Multiple Response Optimization in a Real Case Study of Gasoline Production Process". 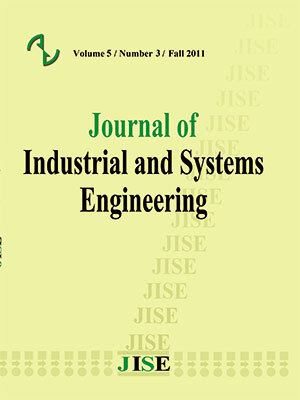 Journal of Industrial and Systems Engineering, 8, 3, 2015, 77-94. Bashiri, M., Rezaei, H., Geranmayeh, A., Ghobadi, F. (2015). 'A Comparison of Regression and Neural Network Based for Multiple Response Optimization in a Real Case Study of Gasoline Production Process', Journal of Industrial and Systems Engineering, 8(3), pp. 77-94. Bashiri, M., Rezaei, H., Geranmayeh, A., Ghobadi, F. A Comparison of Regression and Neural Network Based for Multiple Response Optimization in a Real Case Study of Gasoline Production Process. Journal of Industrial and Systems Engineering, 2015; 8(3): 77-94. 1Department of Industrial Engineering, Shahed University, Tehran, Iran. 2Department of Industrial Engineering, College of Engineering, University of Tehran, Iran. 3Department of Chemical Engineering, Isfahan University of Technology, Isfahan ,Iran. Most of existing researches for multi response optimization are based on regression analysis. However, the artificial neural network can be applied for the problem. In this paper, two approaches are proposed by consideration of both methods. In the first approach, regression model of the controllable factors and S/N ratio of each response has been achieved, then a fuzzy programming has been applied to find the optimal factors' levels. In the second approach, a tuned Artificial Neural Network (ANN) is used to relate controllable factors and overall exponential desirability function then Genetic Algorithm(GA) is used to find factors optimum value. Mentioned approaches have been discussed in a real case study of oil refining industry. Experimental results for the suggested levels confirm efficiency of the both proposed methods; however, the Neural Network based approach shows more suitability in our case study. Ahn C. (2006), Advances in evolutionary algorithms: theory design and practice; Springer Verlag. Al-Refaie A. (2009), Optimizing SMT performance using comparisons of Efficiency between different systems technique in DEA; IEEE Transactions on Electronics Packaging Manufacturing 32, 256-264. Al-Refaie A., Al-Durgham L. & Bata N. (2009), Optimal Parameter Design by Regression Technique and Grey Relational Analysis; Proceedings of World Congress on Engineering, London, U.K.
Al-Refaie A. (2010), Grey-DEA approach for solving the multi-response problem in Taguchi method; Proceeding of the Institution of Mechanical Engineering-Part B, Journal of Engineering Manufacture 224, 147-158. Bashiri M. & Farshbaf Geranmayeh A. (2011), Tuning the parameters of an artificial neural network using Central composite design and genetic algorithm; Scientia Iranica 18, 1600-1608. Beigmoradi S., Hajabdollahi H. & Ramezani A. (2014), Multi-objective aero acoustic optimization of rear end in a simplified car model by using hybrid Robust Parameter Design, Artificial Neural Networks and Genetic Algorithm methods, Journal of Computers & Fluids 90,123-132. Chang H. (2008), A data mining approach to dynamic multiple responses in Taguchi experimental design; Expert Systems with Applications 35, 1095-1103. Chang H. & Chen Y. (2011), Neuro-genetic approach to optimize parameter design of dynamic multiresponse experiments; Applied Soft Computing 11, 436-442. Cheng Chi. Bin., Cheng C. J. & Lee E. S. (2002), Neuro-Fuzzy and Genetic Algorithm in Multiple response optimization; Computers and Mathematics with Applications 44, 1503-1514. Del Castillo E., Montgomery D. C. & McCarville D. (1996), Modified desirability functions for multiple response optimization; Journal of Quality Technology 28, 337-345. Derringer G. & Suich R. (1980), Simultaneous optimization of several response variables; Journal of Quality Technology 12, 214-219. Derringer G. (1994), A balancing act: optimizing a product's properties; Quality Progress 27, 51-60. Desai K., Saudagar, S.P., Lele, S. & Singhal, R. (2008), Comparison of artificial neural network (ANN) and response surface methodology (RSM) in fermentation media optimization: Case study of fermentative production of scleroglucan; Biochemical Engineering Journal 41, 266-273. Erzurumlu T. & Oktem, H. (2007), Comparison of response surface model with neural network in determining the surface quality of moulded parts; Materials and design 28, 459-465. Gauri S. K., & Chakraborty, S. (2010), A study on the performance of some multi-response optimization methods for WEDM processes; The International Journal of Advanced Manufacturing Technology 49, 155-166. Gauri S. K., & Pal S. (2010), Comparison of performances of five prospective approaches for the multi-response optimization; The International Journal of Advanced Manufacturing Technology 48, 1205-1220. Gutierrez E. & Lozano S. (2010), Data Envelopment Analysis of multiple response experiments; Applied Mathematical Modelling 34, 1139-1148. Harrington Jr. E. (1965), The Desirability Function; Industrial Quality Control 21, 494-498. Jeong I. & Kim K. (2009), An interactive desirability function method to multiresponse optimization; European Journal of Operational Research 195, 412-426. Jeypaul R., Shahabudin P. & Krishnaiah K. (2006), Simultaneous optimization of multi response problems in the Taguchi method using genetic algorithm; The International Journal of Advanced Manufacturing Technology 30, 870-878. Kim K.J., Byun J.H., Min D. I.J. Jeong. (2001), Multiresponse surface optimization: concept, methods, and future directions, Tutorial; Korea Society for Quality Management. Koyee R. D., Eisseler R. & Schmauder S. (2014), Application of Taguchi coupled Fuzzy Multi Attribute Decision Making (FMADM) for optimizing surface quality in turning austenitic and duplex stainless steels; Journal of Measurement 58, 375-386. Kuo C. F. J., Tu K. H. M., Liang S. W. & Tsai W. L. (2010), Optimization of microcrystalline silicon thin film solar cell isolation processing parameters using ultraviolet laser; Optics & Laser Technology 42, 945-955. Lan T. S. (2009), Taguchi optimization of multi-objective CNC Machining using TOPSIS; Information Technology Journal 8, 917-922. Lin, H. C., Su, C. T., Wang, C. C., Chang, B. H., & Juang, R. C. (2012), Parameter optimization of continuous sputtering process based on Taguchi methods, neural networks, desirability function, and genetic algorithms; Expert Systems with Applications 39(17), 12918-12925. Lin J. L. & Tarng Y. S. (1998), Optimization of the multi-response process by the Taguchi method with grey relational analysis; The Journal of Grey System 10, 355-370. Li M. H. C., Al-Refaie A. & Yang C. Y. (2009), DMAIC Approach to Improve the Capability of SMT solder Printing Process; IEEE Transactions on Electronics Packaging Manufacturing 31, 126-133. Manivannan S., Devi S. P., Arumugam R. & Sudharsan N. M. (2011), Multi-objective optimization of flat plate heat sink using Taguchi-based Grey relational analysis; International Journal of Advanced Manufacturing Technology 52, 739-749. Montgomery D. C. (2009), Design and Analysis of Experiments; John Wiley. Namvar-Asl M., Soltanieh M. A. & Rashidi A. (2008), Irandoukht, Modeling and preparation of activated carbon for methane storage I. Modeling of activated carbon characteristics with neural networks and response surface method; Energy Conversion and Management 49, 2471-2477. Tsao C. (2008), Comparison between response surface methodology and radial basis function network for core-center drill in drilling composite materials; The International Journal of Advanced Manufacturing Technology 37, 1061-1068. Yum B. & Kim Y. (2004), Robust design of multilayer feedforward neural networks: an experimental approach; Engineering Applications of Artificial Intelligence 17, 249-263. Zimmerman H. J. (1978), Fuzzy programming and linear programming with several objective functions; Fuzzy sets and systems 1, 45-55.